Homemade pimento cheese is a staple for me when I throw a party. 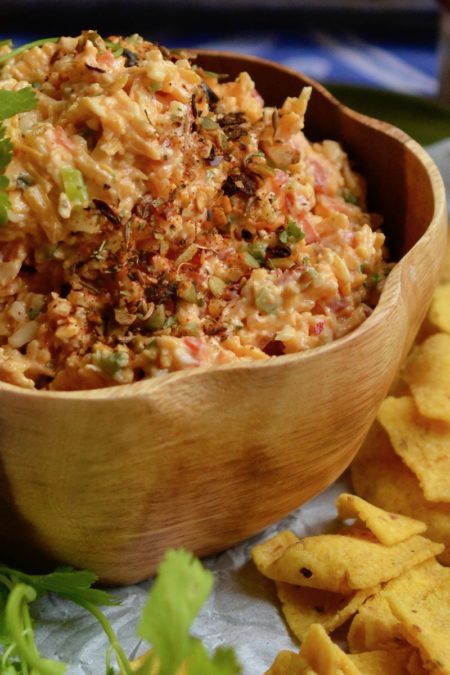 I love a good pimento cheese dip, especially at a gathering or a picnic. However, I’ve always struggled to find one that is not loaded with artificial ingredients. If you’ve ever taken a close look at the packaging of most prepared pimento cheeses available at the grocery store you’ll notice a litany of ingredients; the majority include chemicals, preservatives, and very few “real food” ingredients. Making your own homemade pimento cheese allows you to use better, fresher ingredients like organic cheese, organic yogurt, and crunchy peppers. Most pimento cheeses are loaded with mayonnaise and although I add it to my recipe, I use very little because I’ve never been a big fan. Instead I use Greek yogurt which still gives you the creaminess but doesn’t overpower the dish. I think a pimento cheese dip should taste like cheese – not cream and mayo. Another tip when making my homemade pimento cheese is I typically use a combination of monterrey jack and white cheddar cheese. We often think of cheddar cheese as orange in color, however, many people don’t realize the traditional orange is often added artificial coloring so I typically stick to a white cheddar. For this post I was able to find a natural, organic cheddar which was colored with paprika, a natural spice which gave it that orange hue. Even if you use white cheddar and white jack cheeses, the recipe calls for smoked paprika which will give your cheese dip a slight orange color. Another part of this recipe I love is the crunchy addition of fresh red bell pepper and fresh jalapeno. I often add more jalapeno because I love a bit of heat with the creamy cheese. You may want to begin with 1/2 jalapeno and after mixing, give it a taste and, if it is a mild pepper, add more until you get a bit of heat with each bite. And one more tip… when shredding large amounts of cheese, try using the shredding attachment on your food processor. It makes the process so snappy – it literally took 30 seconds to shred 4 cups. I like to serve this dip at room temperature with corn chips, crackers or tostada chips and right before it goes out to your guests, sprinkle it with plenty of San Miguel nut & spice mix to give it a bit of crunchy pizazz. I hope you make this homemade pimento cheese your go-to recipe. Once you’ve made it a few times, it’s easy to whip up – even without a recipe. Enjoy! Shred both the monterrey jack & cheddar cheese and place in a very large mixing bowl. To the cheese, add the mayo, yogurt, San Miguel nut & spice mix, scallions, red bell pepper, jalapeño, garlic, paprika, and salt. Using a wooden spoon, combine all ingredients. Taste and adjust the seasonings and ingredients according to your preferences. If the jalapeño is not very hot I like to add the entire pepper and sometimes even more - I like a bit of heat in the cheese spread. Serve at room temperature with corn chips, tostadas or crackers. This can be made the day before and then brought to room temperature just before serving.